Lisa A. Brown is a commercial litigator in Dykema's Detroit office. She helps clients across numerous industries maneuver complex legal disputes, advocating on their behalf for creative and effective resolutions. Ms. Brown regularly handles high-stakes contract and business disputes with national implications as well as litigation involving purely private issues. In addition to UCC, commercial and contract work, clients seek her legal representation on recall and warranty cost-recovery matters, automotive supplier disputes, product liability cases, premises actions, antitrust class action work, shareholder and other business litigation. Ms. Brown handles all aspects of case management and complex litigation in state and federal courts, participating as trial counsel, and representing clients before alternative dispute resolution forums throughout the country. Ms. Brown serves as the firm's Hiring Partner and Chair of the firm's Recruiting Committee. As past Chair and current member of the Dykema Women's Business Initiative, she is actively involved in women's networking opportunities and in Dykema's continued commitment to diversity. 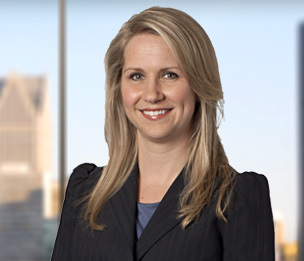 Prior to joining Dykema, Ms. Brown was in the litigation group of Jones Day's Chicago office. Trial counsel in Westgate Ford Truck Sales v. Ford Motor Company, (Cuyahoga County, Ohio, 2013) obtaining a defense verdict in a three-week jury trial of a nationwide class action of truck dealers suing an automobile manufacturer for $2 Billion for failure to sell company products at published prices. Trial counsel obtaining a multi-million dollar verdict in a two-week jury trial for wireless communications provider seeking damages from contractor. Trial and arbitration counsel for Original Equipment Manufacturers in multiple contract disputes seeking the recovery of recall and warranty costs from suppliers. Trial counsel in dispute between automotive suppliers, obtaining favorable settlement at conclusion of a two-week jury trial. Defended major Midwestern city and its water department in several actions, including construction cases, insurance coverage matters, and a class action suit, in which dismissal with prejudice was successfully obtained. Defended airplane engine designer in lawsuit, obtaining elimination of punitive damages claim through motion practice and subsequent settlement by plaintiffs. Represented clients in business tort lawsuits, contract actions and provided pre-litigation avoidance consultations and negotiations. Briefed and argued appeals in numerous courts.